Saint Michael – The Patron Saint who protects the protectors (Police and Military) This design was custom hand drawn by our ReLEntless Defender in House Artist. This design is just plain awesome! Just received my shirt today and it’s perfect. The attention to detail put into this design is amazing. I’m still waiting for approval to use this design as my new tattoo! Love the artistry. I know my husband will love it for his Christmas gift. The art work is beautiful. And is the only reason for the 4 stars. The t-shirt itself is disappointing. It is not the nice heavyweight material that a quality t-shirt is made of. The fabric of this one is so thin I can see through it and I can tell that it will tear easily. For the price of this t-shirt I expected a better quality. It seems like all the online t-shirt shops are using the same cheap shirts. Oh well. The Art work will frame nicely and hang on my wall. This is a great shirt. It’s soft and fits like I would like it to. I’m glad I got a size up because they are an athletic fit. I really love the art work and meaning behind it. I’m overall very pleased with everything. Great quality! Beautiful design! Perfect!! I ordered an XL and it came extra tight. Not sure what size it is because there is no tags or markings. I need a return label so I can get the right size. I love the shirt, just can’t wear it. Just received st Michael shirt and two others I had ordered. All three shirts were exceptional . I will order more in the future..
Great looking T-Shirt !!! By far this is my new favorite !! I’m 5-7, 150 lbs and M fits perfect. Great design…I ride my motorcycle on my days off, and this will be my riding shirt. I can just imagine the cars behind me admiring the design. Thank you guys !! keep up the good work…..
it was smaller that I thought, but not to small that I could not wear it. I love the detail of this graphic. It truly represents the LEO battle of Good versus Evil. I prefer a loose fit and a slightly longer shirt so going up one size as recommended made for a perfect fit. Quick delivery too. I love the detail of this shirt. I’m sure I am going to make my co-workers jealous!. I need this in a hoodie please, the weather is getting cold! Shirt fits properly and the graphic is top notch! Good job! This design was definitely different! Not sure if it will withstand washing and drying like the original shirts, but still an awesome shirt. I’ve had a few people tell me they think it would be an awesome tattoo. Great job on the art. Same great quality of product. Fits like a SCHMEDIUM just like I requested… could be the tamales lol thanks for all that y’all do! Love the graphics on the shirt! Glad I took your advice and ordered one size larger. The only thing that would’ve made the shirt better (5 stars) in my opinion, is if it was on an Under Armour Charged Cotton shirt or something similar. So I was super excited for this shirt, I had ordered an XL but unknown to me a 2XL showed up. I didn’t check the size when it came and had already wore it and washed it. I thought it was a little big but didn’t really care all that much since the shirt is amazing. When I realized it was the wrong size I messaged the company and they sent me a new one with the right size no questions asked. I am beyond impressed with this company and recommend it to everyone. Great quality shirt. It is now my favorite! Fast shipping and excellent customer service. This is a Christmas gift for my son, so the recipient hasn’t received it yet. But, it is a very high quality shirt and the printing is beautiful! I can’t wait to give it to him – he is going to love it! First, the graphics on the shirt are awesome…..I get tired of the Thin Blue Line Stuff or the same old St. Micheal design…this rocks…. Second, the shirt is very comfortable. I ordered one size bigger than I usually wear and it fits nice and ive gotten alot of compliments and inquiries about it…Third, the price is totally worth it….I expected to pay much more for the shirts then I did….and finally and most important…is the outstanding customer service they have I have ordered twice from them now and they are great to talk with and very helpful in making suggestions on sizing !!!! In short…… I’m one happy customer !!!!!! Looks great I would recommend ordering one size up if you don’t like a tight shirt. Bought this as a Christmas gift for a fellow LEO friend of mine. Great graphics and colors!! The artwork on this shirt is just awesome. I love the shirt, how ever the quality of the shirt it’s self does not reflect the price. Use a better quality shirt and I would gladly pay the listed price again. I just got my shirt and love the design but the sizes run small. The XL I ordered fits more like a large so hopefully it doesn’t shrink any. A great shirt! The shirt feels high-quality and the artwork is really cool to look at. As the product description mentioned, the shirt runs small. I’m normally a Size Medium so I ordered a Large and it fits perfectly. Couldn’t be happier! This shirt is one of the most comfortable shirts I have ever worn. The graphics are beautiful and vivid. 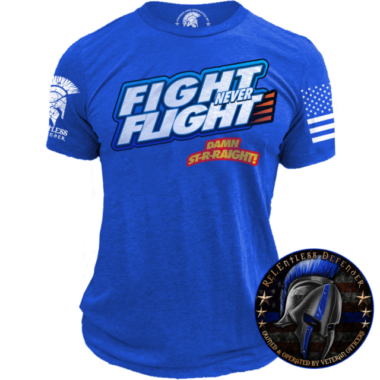 I highly recommend this shirt to anyone who is a supporter of law enforcement anywhere! I got this shirt as a Christmas present, but my wife let me try it on before she wrapped it. GREAT Quality….GREAT GRAPHIC! As others have said, buy a size larger. I am in between a L and XL. I ended up buying the XL. I should have gone to the xxl. It fits, but it being 100% cotton will not go in the dryer! Ok…maybe its motivation for me to spend more time on the running trail to get back down another 10 pounds. Regardless…it looks great! Im sure I will get LOTS of compliments! Great shirt; material and design (although I bought it as Christmas gift to me from the wife and haven’t had the pleasure of wearing it yet). The design is the best I’ve seen since Guido Reni painted the original! Also I was truly happy to finally attempt to order a St. Michael shirt and to receive it as opposed to being told that it was on back order. Great Job @relentlessdefender! Nice shirt, great graphics. Quick delivery during the busy holiday season. 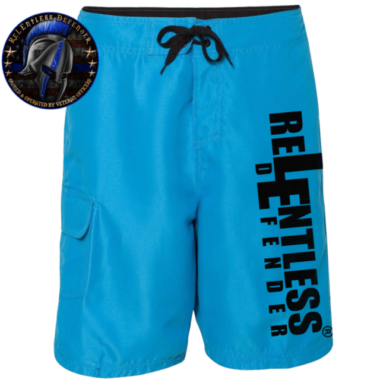 Would absolutely purchase from Relentless Defender again! Will buy more from Relentless in the future. Shirt is awesome, I love the material. However the sizes should be readjusted on the shirt becasue a 2XL that I usually wear is pretty much an XL. The art work if spectacular in it’s representation of what L.E.O’s do everyday. It inspired to continue to defend and makes it matter; not what the world does, but what we do!!! I am very pleased with the quality, and timeliness of delivery. I am also pleased to help the cause. Extremely pleased with the material and the graphics on the shirt. Looked so good my wife has tried several times to keep it herself. Couldn’t ask for a better product or company to buy from. I recently bought your archangel shirt and I love it. Not knowing what to expect, like a poor quality shirt. But no, great fitting good quality and sizing. The graphic on the back is what caught my attention. I have always carried Michael the Archangel around my neck. So when I saw this, I ordered it right away. When I wear it, people ask me to see it and or take pictures. Thank you for the great shirt! The design is beyond comparison, the colors are just beautiful. The fabric is one of the best quality fabrics I have had the pleasure of wearing. I’ve worn it three times, and every time I wear it out in public, people always comment favorably on the nice image, then (family and friends) will touch the t-shirt fabric itself, and they want one!! I love the shirt! It’s a great quality shirt that fits well and the graphics are sick. I just love it. I bought this shirt for my husband and he absolutely loved it. The material is very soft yet strong. I’m buying my shirt next. The shirt and screen printing were both top quality. I have a lot of printed tees and this one ranks up there as one of the best quality shirts I have ever purchased. 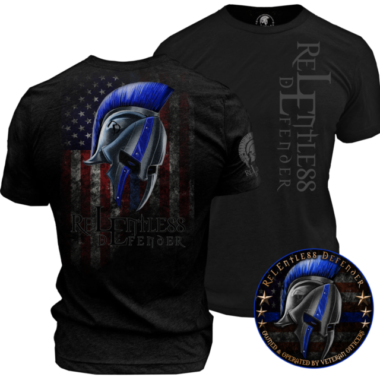 Looking forward to my next relentless shirt! Order a size larger than you wear. At first I thought the quality of the shirt was bad and found out that these shirts are actually made better than the Gilden shirts that I am used to wearing. The graphics are stunning and creative. Customer service is awesome and the President of the company is obviously concerned that their customers are happy with their products. They go out of their way to make sure you are satisfied! I will be ordering from them again. Fast shipping! Second shirt I have ordered and I love them both. Great way to show support for law enforcement. Awesome graphics and great shirt. I will order more in the future and the flag. The shirt definitely fit as expected. Shipped fast. The colors are very vibrant. The shirt is just so cool and awesome!! Picture was better than the print; however, I will still proudly wear it. This is a great shirt! I am very happy with the product and the efficient processing of my order. The sizing seems consistent with my typical shopping preference, maybe a touch more on the snug side, but hardly noticeable. It’s a great fitted shirt. The design is original and very cool. I love St. Michael. And the helmet fashioned in the spirit of an ancient Greek/Spartan hoplite is right on the money for this archangel. The front of the shirt is graced with a classy crest serving as a Relentless logo. Very happy with this purchase. Would love a drawer full of these shirts! I brought theshrit for my son he love it I like the material nice and soft and it came in 3 days I will be buy from your company again. Super soft and thin material. Love it! Picture doesn’t do it justice. My St. Michael shirt is awesome , get constant compliments on the quality and artistry. By far one of the most comfortable shirts ever ! This is an all around great shirt. From the design to the fit and feel. I get asked where I got it from and reccomend your site. I look forward to shopping with your team in the future. Very happy customer. The graphics on the shirt are amazing. All my friends want to know where I got it from! Just love the shirt! Couldnt ask for a better shirt! I ordered two St. Michael’s shirts and my boyfriend and I absolutely loved them. Excellent quality! The customer service was outstanding!! I love the art work on the shirt and think that it is a fitting tribute to the ultimate defender. The quality, fit and feel of the shirt is excellent. I will be buying more. I will be ordering more for my son who is a police offer. And more for me. We really love the designs Thanks you for the support the company shows. The design is beautiful and it’s a comfortable fit, great shirt and I’ll be buying more in the future. When i first saw this tshirt online my first thought was yea i have to have that one. I bought the st michaels tshirt and i love it. Not only are the graphics outstanding on this shirt but but the tshirt itself is not some old black everyday tshirt. This is quality and i would recomend anyone to purchase relentless defender products. I definitely love this shirt. I got it for my boyfriend and he loved it along with his other shirts he gets compliments all the time thanks for the fast delivery and great shirts! I showed this shirt to my wife. She loves the artwork. We had to get 2. Very nice shirt. Material seems to be quality but was a little disappointed that graphics weren’t brighter, but could just be me. Fits great! quality material and great artwork! Described very well, foit really good and looks great! To be honest, I got the shirt to steal the design for a tattoo. Nut the shirt is really good quality. Bright and a good fit. The artwork is mesmerizing and the shirt fits great and looks good. I will be ordering more. This shirt is comfortable and looks good too. I’ve worn it twice already since getting it, and love the shirt!! Shirt was a custom order because I’m in a wheelchair, graphic printed on front so it would be visible. Received shipment promptly, quality of work second to none. I’d be more than happy to do business with them again. Bought this for my son’s birthday. He loves the design and quality. Awesome artwork, excellent product. Love this shirt. Wear it all the time. Friendly and helpful staff. Will definitely be a regular customer here. This shirt is great! It has very colorful artwork and it is very soft. It’s comfortable and a favorite shirt. Super comfortable and graphics are awesome! Great fitting shirt with an awesome design. Can’t say much other than bad to the bone shirt. The product is great but I ordered two shirts and only received one. My order confirmation email has two shirts but only one was sent. Got this shirt (my second) and I’m extremely happy with it. The material used is super soft (girlfriend loves it) and very durable. The printing is of a high quality – my first shirt hasn’t even began to fade and I’ve had it for several months now. Wonderful product – money well spent!! This was given as a gift to my husband, a police officer, he loves it! The size was perfect and the quality is great, it’s a nice shirt and the graphics are vivid and good quality. We’ve washed it twice and it looks just as good as when we received it. Overall, very happy! Great fit and excellent graphics..plus saved me from getting a St Mike tattoo!!! Super comfortable and I love the fit! Will definitely buy more! I like the quality of the material and the fit is very comfortable. I like the quality of the material and the fit is very comfortable. The print looks great! I placed my order about 2 weeks ago now. It came in on time with no delays. Nice fitting shirt very comfortable to wear and fits nicely. The images on the shirt are applied very well you can barely tell they are actually there. I’ll be honest there should be a 10 because this shirt is awesome! This was my second t-shirt purchased. The graphics are excellent and the fit is perfect. Fits as expected. Soft and comfortable. A must have! Looks great & my girlfriend loves it! Athletic fit with great graphics. It’s my second shirt from you guys and I am sure I will be getting more soon. Amazing print quality. Perfect fit! Nice soft material and the print is bold and bright. I hope to purchase many more shirts and a challenge coin from reLElentless defender. Stay safe out there LEOs and God bless you and your families. Awesome Shirt, no cheap materials, great color!!! Will be buying several more shirts! Stay Relentless!! I have been extremely pleased with the high quality and the great pricing of your t-shirts. The graphics are top notch and is of the reasons I’ve purchased your products. Also, the fact that a portion of the proceeds, from the sale of many of your shirts goes to charitable organizations benefiting police officers. As I said in a previous review, I have been extremely pleased with the quality of your shirts and the graphics are outstanding. I particularly like the Christian message the shirts I’ve purchased convey. That is why I like to where them to church, as a testament to my faith. Again, the proceeds going to law enforcement charities is another big reason I shop your website. Keep up the great work. Received my shirt and the quality was great! Excellent art work and found no defects. Will absolutely order again. I have been waiting to buy this shirt. I saw it on the website, but my size was sold out. So every week or so i would check and see if it was in stock. When i saw that it was in stock, i jumped to buy it and i am glad i did. The quality of the picture and the soft cotton material is what keeps me coming back. 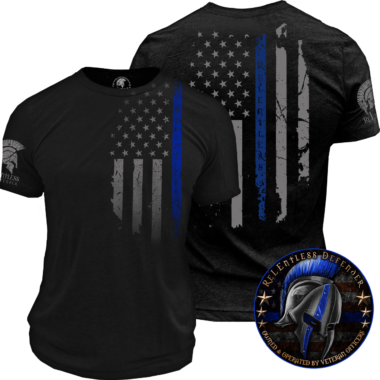 I recommend anyone who wants a good quality shirt and to show their support for Law Enforcement to buy here. The shirt looks amazing. Bought it for my husband who is a sheriff. He loves it! Great design and product. I’ve never had an issue with any item I’ve bought from this company. Top of the line products with awesome designs! I like your shirts because they fit very well as well as the designs. I ordered several shirts and have loved them all. I have gotten many compliments on this shirt and I have referred all to RD website. Great look nothing else like it I have seen yet. 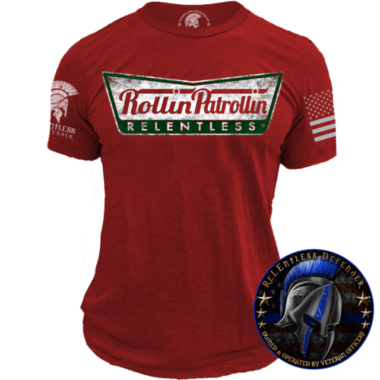 THIS SHIRT IS AMAZING IN FIT REALLY FEEL SOFT AND THE COLORS MAKE IT ONE OF MY FAVERITE TEES AND I HAVE A LOT, YOU CANNOT GO WRONG WITH A PURCHASE FROM RELENTLESS DEFENDERS . I HAVE BOUGHT OTHER PRODUCTS HAT, STICKERS, AND OTHER TEES THEY ARE ALL GREAT. LOVE THIS COMPANY PLUS YOU WILL KNOW THAT OUR MEN IN BLUE ARE SPECIAL IN EVERY WAY ! went to an arena football game and was asked where’d you get that at least a dozen times!!!!! It’s a great shirt the material feels good against your skin, the fit is awesome not too tight not too loose. Not to mention the logo and the scene of St Michael with the blue line is awesome. This product was everything i expected, what surprised me most was how fast it came in the mail. Thank you for the shirt, i think relentless defender has come a long way and has shown to be one of the best police websites of them all! Great shirt. Ordered a 4x, and it fits like a 4x. I’ve ordered shirts from other places and they are not true to size. Relentless Defender got it right. Love the shirt. And the prompt service. I bought an XL instead of a L since these shirts tend to fit a little tighter. Comfortable, looks good. Awesome shirt! My son-in-law is a Navy Medic and a Police Officer. He loves these shirts! Very comfy! I bought this t-shirt for my husband (who is a police officer) for his birthday. The fit is great, the fabric is breathable and soft, and the colors are vibrant. He has gotten compliments every time he wears it – thank you! I catching and bold graphic. Best St. Michael graphic out there. I sized up based on my body type and the fit is great. Have ordered several other items from this company. I am an artist and I absolutely love and respect the detailing in this art. The shirt is comfortable and fits nice. It is my new favorite shirt! Really love the feel of the shirt, lightweight and comfortable. The design and the message behind it is awesome. Awesome design, great shirt, can’t go wrong. ILOVE my St Michael shirt, love the colors, details especially love the way it fits, so comfy! While I like the design, it said to order 1 size larger if you like a looser fit due to being athletic cut… this was not the case and the shirt is waaaaaay too big. Definitely not athletic cut. Only 1 shirt that I ordered seemed to be athletic cut, the rest were definitely too big. I wish I would have ordered XL like I normally wear instead of the 2XL. The wife washed em before I could try them on so kinda stuck. Sizing off. Not athletic cut ordered 1 sauce larger to accommodate, way too big.